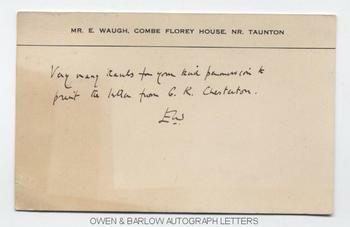 EVELYN WAUGH Autograph Post-Card Signed. English novelist. Author of 'Brideshead Revisited', 'Decline and Fall', etc. 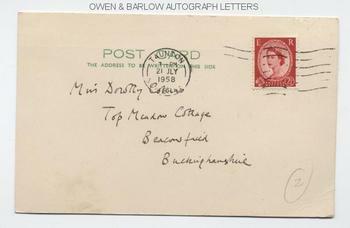 ANS (signed with initials) on post-card. Combe Florey House, Nr Taunton. Not dated (but postmarked 21st July 1958). To Miss Dorothy Collins, Top Meadow Cottage, Beaconsfield, Buckinghamshire. "Many thanks for your kind permission to print the letter from G.K. Chesterton." Dorothy Collins was the secretary of G.K. Chesterton. The note is probably in connection with the biography of the Catholic priest and writer Ronald Knox, on which Evelyn Waugh had been working at Combe Florey over a period of about two years.